The cloudBit is the easiest way to create internet-connected devices. You can now snap the internet to anything! Retrofit your thermostat to control it remotely, or set up a sound-triggered alarm system that texts you alerts - the possibilities are endless. No programming, soldering or wiring required. The USB power may be the smallest in the series, but it's big enough to send juice to all your creations. Connect a USB cable (included) to your computer or phone charger to start the power flowing. 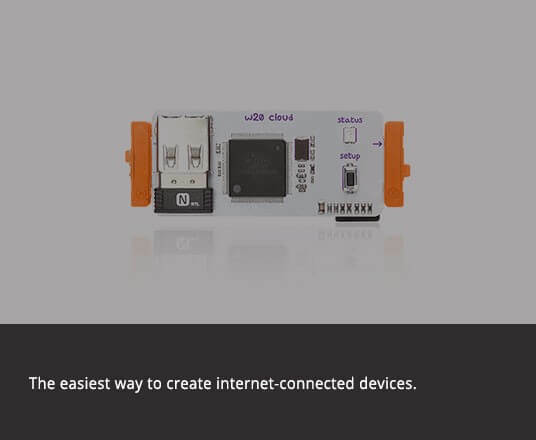 Try it with an LED to make the simplest littleBits circuit. If you're looking for a permanent installation, the USB power adapter enables you to plug your USB power directly into the wall. The power adapter and USB cable combo is the perfect way to power permanent creations! You can extend your inventions with the 1.5 meter long USB to micro-USB cable.